Please join us for an evening with author Neil Kressel who will discuss his new book on antisemitism in the Muslim world. After the Presentation and Q&A, join us for a private reception where Mr.
Kressell will be happy to autograph copies of his book. STUDENTS get in FREE. Tickets at the door. From the 1950s through the 1980s, antisemitism everywhere seemed to be on the wane. But as Neil Kressel documents in this startling book, the Muslim world has resurrected in recent decades almost every diatribe that more than two millennia of European hostility produced against the Jews, and it has introduced many homegrown and novel modes of attack. Thought it is impossible to determine precisely how many of the world's 1.2 billion Muslims hold anti-Jewish beliefs, Kressel finds that much bigotry comes from the highest level of religious and political leadership. Compounding the problem, as Kressel demonstrates, many in the West refuse to recognize this issue. The growing epidemic of hatred has been largely ignored, misunderstood, or downplayed because of apathy, ignorance, confusion, bigotry, ideology, purported pragmatism, and misguided multiculturalism. Those who value human rights ignore antisemitism at their own risk, he cautions, noting that no antisemitism regime or movement has ever been otherwise reasonable or progressive. Kressel argues convincingly that Muslim antisemitism provides an acid test of the seriousness of Western liberalism. If the West fails to stem this growing tide, as now seems likely, future affairs will not go well for the true proponents of democracy. "All religions and cultures suffer from sources that preach hate against the 'other'. Throughout history some have, tragically, practiced what their sources preached, while some have sought to dismiss or even counteract the hateful words of their sources. In this book, Neil Kressell shows how extremists within Islam, many in leadership roles, have exploited some of their hateful sources to preach and practice a virulent form of antisemitism. Read this book and judge for yourself." "Kressel presents undeniable and yet long-denied information about the pervasive and insidious nature of Islamic antisemitism - and he does so with a pained sensitivity that is both admirable and heartbreaking. Reasonable, patient, and nonemotional, Kressel is antiparanoid and utterly fact-driven." "While parts of this book make me uncomfortable, I must admit that it represents, rather sadly, what many of my coreligionists think." "Kressel handles one of the hottest topics in the world carefully, calmly, and coolly. 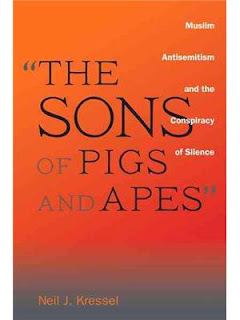 He explains the dangers of Muslim antisemitism while destroying the many excuses for it that are so often offered - and shaming those in the Muslim world or in the West who downplay these modern forms of the oldest, and one of the bloodiest, hatreds in world history." "Although Neil Kressel's magisterial essay is primarily addressed at those in the West who pretend that antisemitism is no more than a tragic memory, it is also of great value for those Muslims who dream of, and increasingly fight for, a free society. Kressel's message is clear: fighting anti-Jewish ideas and practices must be an integral part of any strategy for freedom in Muslim countries." "An important but disquieting book. Neil Kressel's skill as a social scientist is manifest throughout the work and his arguments persuasive. To cure a malaise one must first confront its symptoms and seek their underlying causes. In dealing with Muslim antisemitism, Kressel's work is more than helpful - it is essential." Michael Berenbaum, Former Director of the United States Holocaust Research Institute at the US Holocaust Memorial Museum.